The Hindu god Shiva appears in several incarnations. Here, Shiva appears as Nataraja, or Lord of the Dance. He raises his left foot in a graceful dance pose. 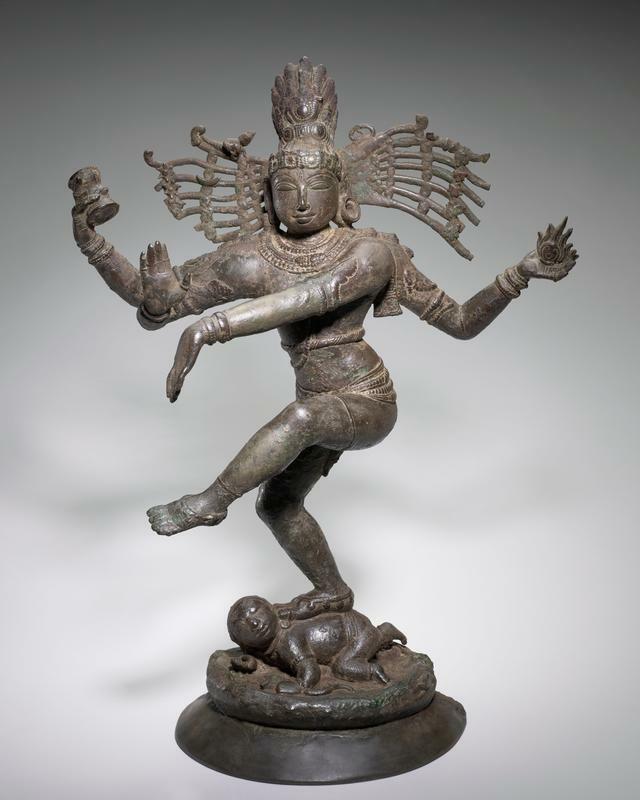 In his upper right hand, Nataraja holds a drum, the sound of which manifests creation. The flame that he holds in his upper left hand symbolizes destruction. Together, they symbolize the creation and destruction of the cosmic universe. The posture of the icon’s lower left and right palms signifies protection. The foot that rests on the demon’s back symbolizes the elimination of ignorance, while the raised left foot signifies salvation. A now missing ring of fire, symbolic of the simultaneous and continuous creation and destruction of the universe, would have encircled the bronze icon.